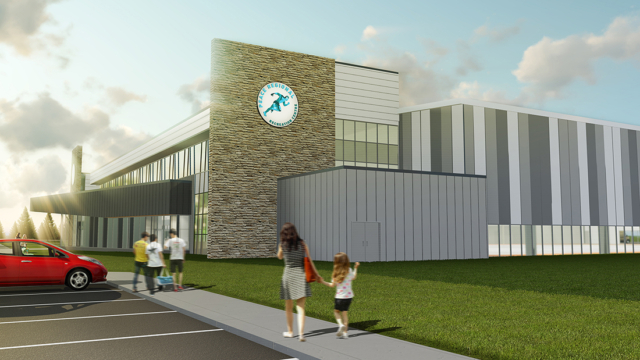 The Peace Regional Recreation Centre will contain one NHL sized rink, one multi-use field house, a three-lane walking track, a fitness room, three multipurpose community rooms, and an indoor children’s play space. Peace River is a business, governance, and cultural hub drawing people from across the region – with a regional population around 20,000 people, there is a diverse need for recreation spaces. Concerts, large-scale community events and more can all take place here opening up new possibilities in the colder months when outdoor events are not feasible. An indoor children’s playground complete with a large community room and kitchen will offer visitors new and improved amenities. 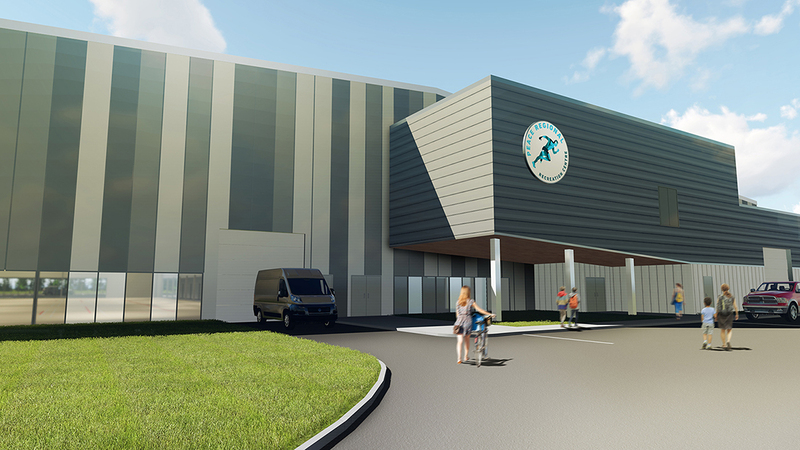 For those individuals, businesses, and organizations looking to contribute there are several opportunities to donate or sponsor the new Peace Regional Recreation Centre. Info on donation, sponsorship, and naming rights is available at the link below. Thank you to everyone who has donated or agreed to sponsor part of the facility. Project work has continued at a steady pace throughout the winter months. As February draws to a close, some major elements of the building have been completed, such as the front building panels, internal concrete stairs, exterior masonry, some tiling, most drywall, and hot water heaters and boiler systems have also been installed. A delay in concrete availability slowed progress on the arena slab. Due to the extreme cold at the beginning of February concrete was not available, and so the pouring of the arena slab had to be postponed. It is expected to be completed in early March. Moving into March focus is continuing on internal parts of the building. Tiling will be taking place in the change rooms and showers, drywall is expected to continue, and painting will take place in some areas. Canadian Natural Fieldhouse and the running track floor under construction. A view from the fitness centre looking into the Canadian Natural Fieldhouse. The main entrance to the new Baytex Energy Centre, bathed in natural light. The flooring for the arena, concrete will be poured in early March. Close up view of the masonary work on the outside of the building entrance. A web camera was installed on the roof of the pool, the intention is to photograph the construction of the new centre and the demolition of the old arena. The pictures will be stitched into a timelapse to show the scope of the project once finished. In the meantime, the feed is accessible here. A new image is posted every 20 minutes, the date and time in the bottom right-hand corner will tell you when the image was taken. A new one should appear every 20 minutes if the image is not updated please refresh the page. As fall wraps up construction on the Peace Regional Recreation Centre is continuing full tilt and on schedule. Throughout the end of summer and early fall construction focused on concrete, putting in floor bases and prepping the second floor, the floor slabs are now 80 percent complete. Additionally, the roofing is complete now on the non-pre-engineered areas. The new ice plant has arrived and is in the ice plant rooms, as has the cooling tower for it. Air handling units have arrived on site and will be installed over the next few months. Looking ahead the entire structure is expected to be completely enclosed in about six weeks. Custom glass is being cut to fill in the windows and door are on their way. Due to the unexpected good weather crews are also able to begin work on some of the external components such as curbs, gutters and sidewalks. Framing for the interior walls followed by drywall is also excepted to take place later this fall. Walking past the front of the building. View of the fieldhouse from the second floor. The area that will become the fitness centre. The new ice plant, delivered and in it’s room. In addition to the construction work, a new webpage has been set up for anyone who would like to donate to the project. Every little bit helps and every donor will be recognized, for more details visit our Donations & Sponsorship page. Throughout Spring and summer, work at the Peace Regional Recreation Centre has focused on forming the major components of the interior part of the building. Structural steel is now in place for all major areas of the building, including the second floor mezzanine, the fitness centre, and staircase within the building. Masonry work has focused on spectator seating, changeroom walls and the elevator lift-shaft. Recently the concrete slab for the fieldhouse was poured. During the last part of the summer construction season, there will be more internal steel framing work, as locations like the mechanical rooms start to take shape. Concrete pours for the storage room, bleacher columns, building centre, ice pit, cooling tower base and rink will also take place over the remainder of the summer. Construction remains within budget, click here for more detailed financial information. The front entrance of the centre. Work on some of the steel framing. The newly poured floor of the Canadian Natural Fieldhouse. A side view of the front showing some of the stairs and interior features that are being installed. Over the last six weeks, significant progress has been made on the Peace Regional Recreation Centre, as the steel skeleton of the building has gone up. As January closed crews completed work on the foundation, months of prep work now allowed for the steel beams and wall support to be put in place. Throughout February and early-March the frame of the building took shape with the installation of the steel frames. Over the next month roof and side panels will be installed, while at the same time work will continue to take place on certain interior components. Such as the spectator seating areas, where support columns have already been installed. The base of the structure is beginning to take form following the completion of the foundation piling. 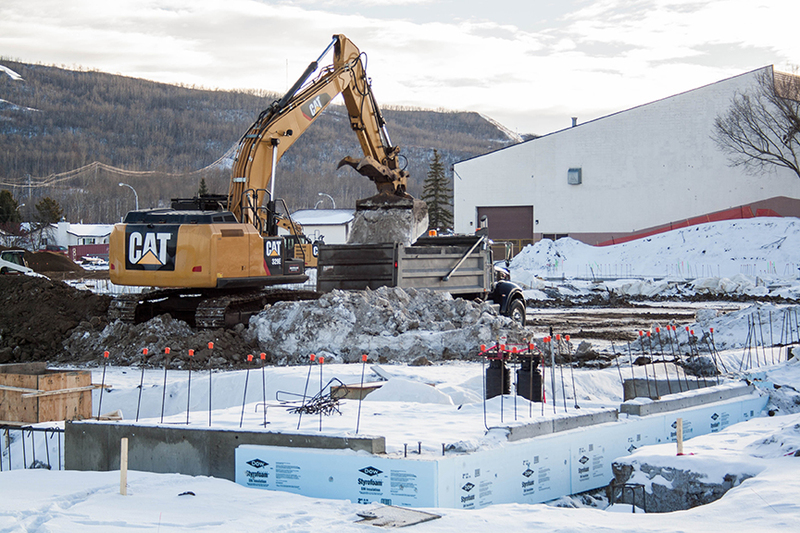 Prior to the end of 2017 and the holiday shutdown, crews were able to complete the excavation for the concrete foundations of the Peace Regional Recreation Centre. The outline of the building has begun to take shape with the pouring of concrete into the foundation and the arrival of steel structural supports. Additionally, adjustments were made in the plans to relocate the rink board entrance, this would help accommodate Peace River Minor Hockey’s new dividing rink board system for practices. Work on digging foundation part, January 18, 2018. Over the month of January and into February expect to see the skeleton of the building start to take shape and rise up. The Peace Regional Recreation Centre construction has encountered some impact to its project schedule. This is due to the need to extend over half of the piles, and to drive them deeper to ensure they meet the required depth as per the structural and geotechnical engineering requirements. As of November 5, 2017, there were 20 piles remaining that need to be resolved. These remaining piles are expected to be resolved over the next two weeks. Overall, the impact to the project schedule has meant an extension by approximately two months for a project completion date of March 2019. A view of the construction site on Nov. 27, 2017. Structural steel along with critical concrete beams are scheduled to begin towards the end of December. In addition, Administration met with a local basketball club to coordinate the addition of lines for basketball courts in the field house. The club was pleased with the flooring being installed in the building, therefore courts were added to the design for game lines. A webcam has been installed on the roof of the Peace Regional Pool. This camera will document the process of construction and the demolition of the current arena. A live feed is available above. 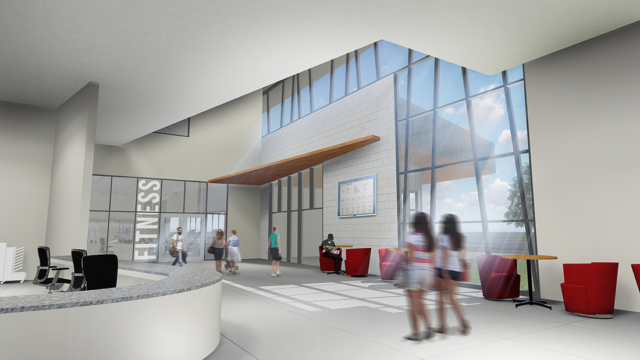 Work to install electric trunk lines for the new rec centre will be taking place from August 17 to August 22. During that time there will be reduced or no access to this street as MacMillan construction will be excavating a trench for the new lines. The Peace Regional Recreation Centre, construction started Monday, July 17, 2017. Pilings for the foundation will begin and will be the initial stage of construction for approximately four weeks. The Town of Peace River thanks residents for their patience and appreciate their cooperation in proceeding with the building of the Peace Regional Recreation Centre. Currently, the Town has most but not all of the required funds to build the Peace Regional Recreation Centre. As we approached the contract finalization phase we also finalized our funding plan over the projects life plan. 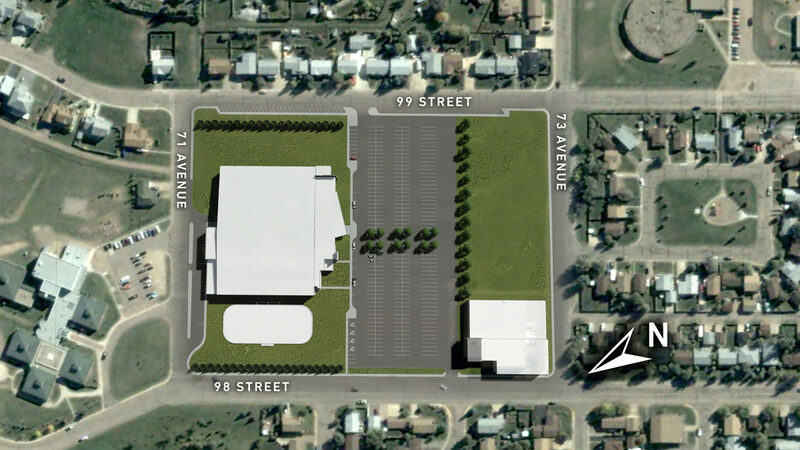 That plan was presented to Council and approved during a Council meeting on May 29. While the plan outlines a complete cash flow plan for the project, Administration missed the requirement for article 254, requiring borrowing to be done at the start of the project. Past practice had been to debenture as needed, which was not always prior to commencement. Administration relied on the understanding that previous practice was based on having correctly interpreted the requirement. Once Municipal Affairs brought this to our attention, we rectified the issue immediately by taking the bylaw to Council at the June 26th meeting. Funding for the entire five-year capital plan, including the Peace Regional Recreation Centre, have been incorporated into existing tax rates. The actual build of the Recreation Centre is not projected to increase taxes. The capital plan is included in the 2017 Operating and Capital budget linked below. Pre-tender meetings and consultations have been completed and the Peace Region’s newest recreation destination remains on schedule. The next step will be to issue tender documents in late-winter 2017. Final design concepts were received in November of 2016. Since then the Regional Recreation Facilities Committee, a committee comprised of councillors from the County of Northern Lights, MD of Peace, Northern Sunrise County and the Town of Peace River, has met with the public and the user groups. To accommodate requests from user groups the committee has worked to modify the design. Up to three additional change rooms have been added. The large team change room has been expanded, with storage and desk space. Added 189 square metres of warm storage for user groups. Curtains in the field house will overlap to prevent errant balls from flying onto the running track. Ultra bright, ultra high efficient LED lighting will help improve the indoor lighting while lowering operating expenses. Three multipurpose rooms, for community booking and use, have been added. Food prep area and kitchen will be three times as big as the previous one, with layout and design by Tesco, a professional in commercial kitchen design. An overlay of the finalized site plan. With the floor plans and designs completed, the architects are now working on final blueprints. The committee anticipates tendering for construction on this project in March. Conceptual drawings and renderings were on display on Thursday November 10, 2016. This was the second public open house update on the project, during that time Councillors from the partner municipalities, Town staff and the architect took questions from residents. For those that were unable to attend the design showcase this we have made the information available online. 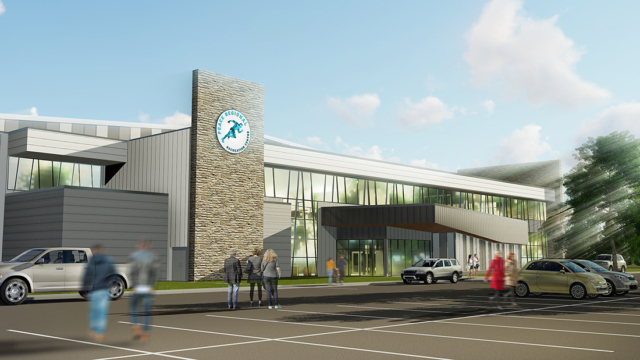 After years of public consultation, through public discourse, a regional recreation needs assessment, public regional surveys and more, the design of the Peace Regional Recreation Facility is taking shape on paper. November 10, 2016 from 5PM to 8PM members of the public will have the opportunity to preview the region’s newest recreation destination during a design showcase taking place at the Baytex Energy Centre. 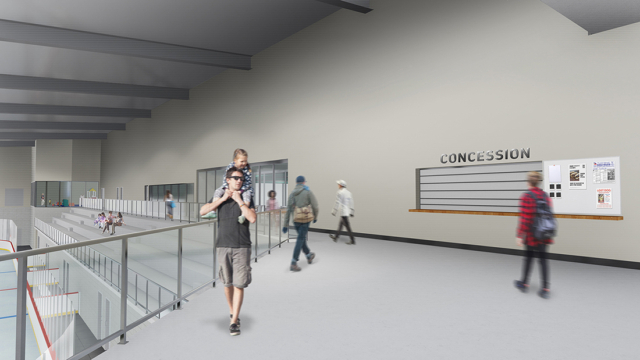 Elected officials from the Regional Recreation Facilities Committee, which is driving the Peace Regional Recreation Centre process, will be on hand as well as architects from BR2 Architecture, the firms doing the designs. Additionally there will be design drawings, renderings, and more detailed information to help the community envision the project. 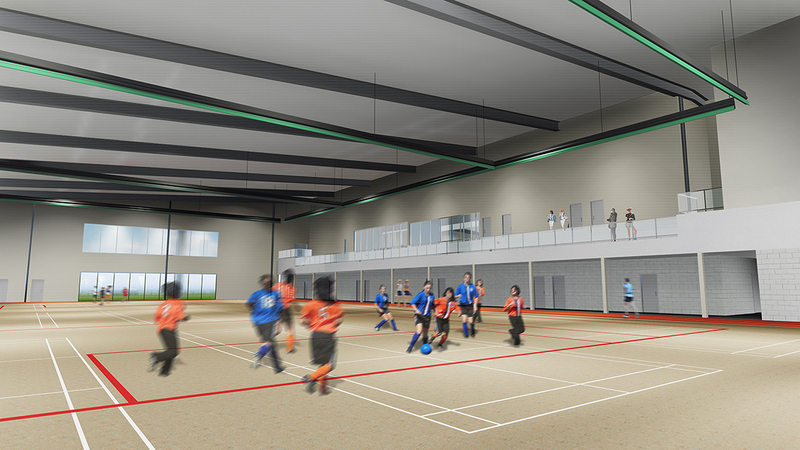 A spatial drawing of the main floor shows the rough layout of the new Peace Regional Recreation Centre’s amenities. 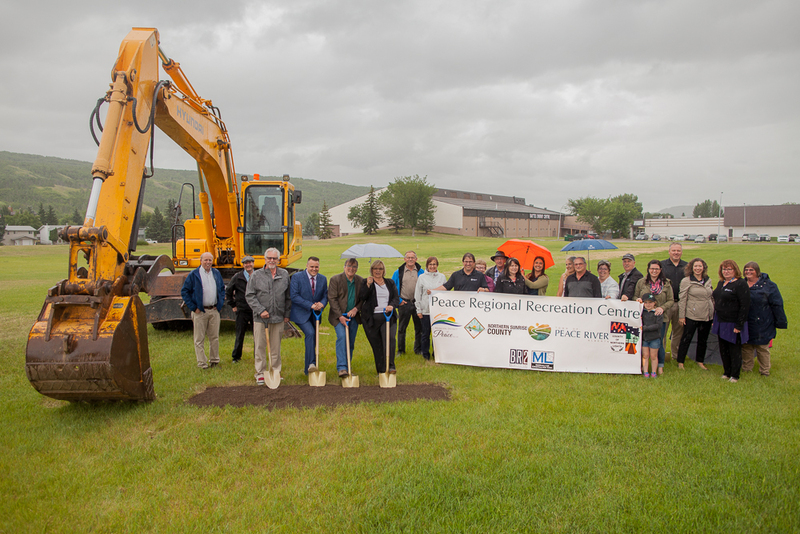 As the final weeks of summer waned this August work quietly began on the region’s newest recreation centre. Survey work began on the site with the drilling of bore holes to conduct a geotechnical survey of the area. Sonic equipment helped capture critical ground composition information from depths of more than 14 metres. That info has been sent back to the architects working on the design drawings. Meanwhile the Regional Recreation Facilities Committee has been hard at work, putting the final touches on the design requirements, and budget. 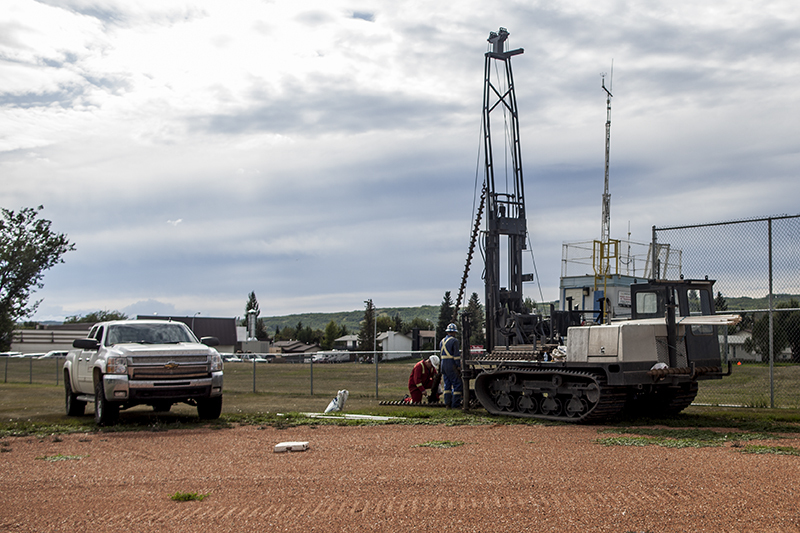 A drilling rig is used to bore test holes into the site of the new recreation centre on August 22, 2016. The test holes along with sonic imaging will help to paint a picture of the earth beneath the surface, this will be critical in laying the proper foundation. Over the summer, committee members met with each other, the project architect, and user groups to discuss design, process and budget. Now the final decisions and budget have been submitted to the architect and design drawings are currently being put together. A design showcase is also being planned for mid-October, where members of the committee and the architect will be unveiling the final approved drawings. All in the project will cost approximately $23 million to complete with $16.1 million already committed. The remaining $6.9 million will be funded through a fundraising plan put together by the committee. Currently the plan is in the final stages of discussion and development. Over the next few months area residents will hear about and be asked to participate in a fundraising committee to assist with decking the halls of the new facility. Recreation facilities serve a valuable need in a community. First and foremost they offer a location to play the intended sports but they often become more. Recreation facilities are places were friendships are forged, the community comes together and is celebrated – they are focal points of community. Two years ago Peace River found out that our arena was going to need to be replaced in a five year period. Through collaboration and hard work regional neighbours have come together to make the impossible, possible and to ensure the Peace Region has a rec facility for everyone to enjoy for decades to come. 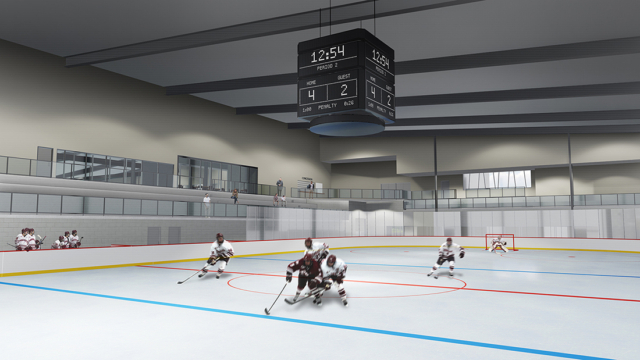 At its core the Peace Regional Recreation Centre will serve field and ice sports through a full-sized field house and a NHL sized hockey rink. In addition to the field house, the design will incorporate a running and walking track. As a community facility a large kitchen area is also being included in the design to facilitate community concession sales as well as other events requiring food prep. Located near the current Baytex Energy Centre, the Peace Regional Recreation Centre will help solidify the north-end as a recreation hot spot, and will complement the existing Peace Regional Pool. It will also ensure that running/walking sports as well as field sports have a year-round home at an indoor facility. 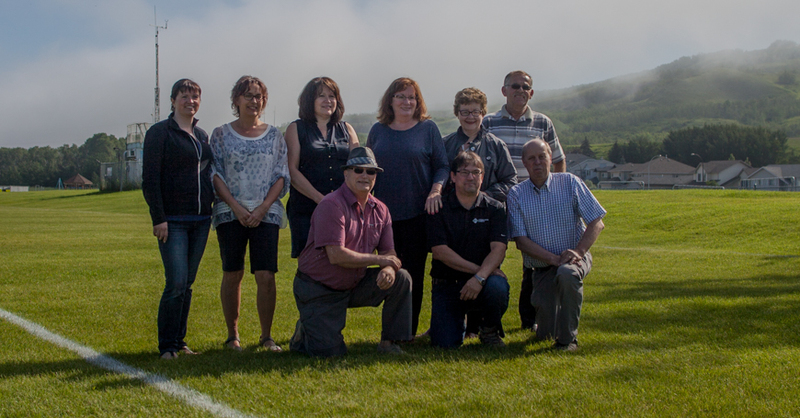 The Regional Recreation Facility Committee – pictured at a media event on June 25, 2016. During this time the design of the facility will be fleshed out completely, it’s features and soft costs identified and ultimately budgeted for. Residents can expect a public update in the early fall with design drawings and schematics. This period will include updates to stakeholders. That means members of the committee will be meeting with user groups, confirmed and potential as well as other impacted groups and businesses regarding the project. By the end of the 2016 the budget and design will be finalized and signed off on. That will allow the permit and tendering process to begin in early 2017. This stage is dependent on weather and conditions for a start date, however, ideally shovels would be in the ground for May of 2017. Specific dates for the opening of the facility will be confirmed during the construction process, however, we anticipate about 18 months of construction. In 2014 a Town of Peace River engineering report discovered substantial foundation and serious structural issues in the current Baytex Energy Centre. It was not practical to repair the old building. At the time an engineering estimate gave the building a life expectancy of five years. In response to this the Regional Recreation Facilities Committee was struck to come up with a solution. This committee contains Council members from four municipalities including County of Northern Lights, MD of Peace, Northern Sunrise County and the Town of Peace River. Initially, the committee undertook a recreation needs assessment, which identified where gaps in recreation options existed in the region. This enlightening report was published in the fall of 2015 and helped set the stage for the committee’s decision to prioritize an ice sheet, running track and field house. Since then the committee has worked to raise the funds required to build this important facility. While this process will continue over the next few years, $16.1 million has already been committed by the member municipalities.